On Tuesday, the team headed out for another survey, but made a pit stop near Grand Manan to pick up some special guests- a film crew from France! This film crew is from One Planet, a production company that creates films "dedicated to science, society, nature and the environment." They are currently working on a series of documentaries that focuses on unique ecosystems around the world, and are in the area to cross the Bay of Fundy off their list! Our two vessels meeting at sea to exchange passengers. The Nereid pulled aside their chartered vessel Midnight Adventure and we helped an interviewer, Noelie, and a cameraman, Yannick, aboard. 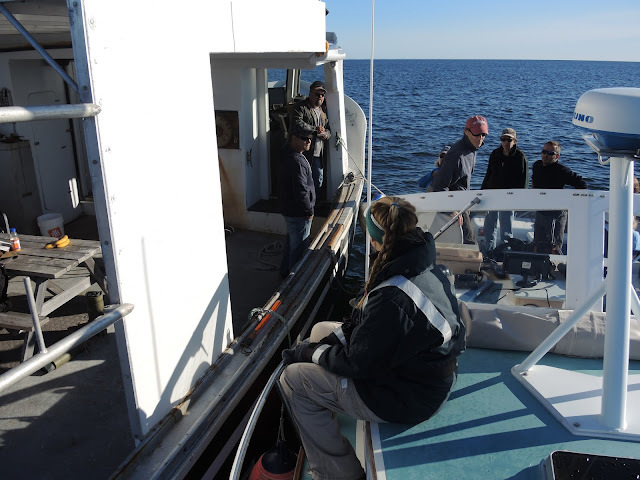 They were eager to collect footage of any large whales, since the Bay is home to many species, but were especially hopeful that we might find right whales. We saw fin whales right off the bat and were able to get some close looks at them before heading out on our tracklines around the western side of the Bay. About two hours into our survey, we sighted a group of four humpback whales, including a mother and calf pair! The humpbacks were fluking at regular intervals, so we were able to estimate when and where they would surface, allowing us to get close enough to collect some great photos for a group that does humpback ID. As soon as Yannick stopped filming and we put the cameras away, the calf breached- isn't that the way it always goes?! Continuing through a very productive deep basin known as "The Groove" we saw many fin and humpback whales- our total count for the day was 17 fins and 13 humpbacks! We also saw a fair amount of different species of seabirds, including our first puffins, phalaropes and northern fulmars of the season. However, no right whales were observed on our survey, and so the film crew shot some more scenes of fin whales. Though we didn't find our elusive species, hopefully the viewers of the One Planet show will learn something new about right whales through the interviews taken on the Nereid with Moe. As we headed back in to Lubec, we discussed our survey strategy for the next day out. The absence of right whales in the middle and western side of the Bay heightened our interest of investigating a different part of the Bay: The East!